Physical Description: 1 photograph 24 x 18 cm. 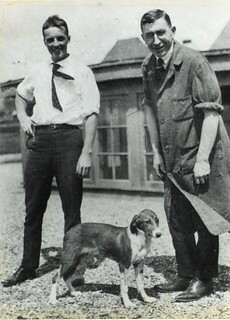 Scope and Content: Copy of black and white photograph showing Banting and Best with a dog on the roof of the Medical Building, University of Toronto. This well-known photo was taken by Henry Mahon in August 1921. The dog, although frequently identified as Marjorie (Dog 33) is actually Dog 408. Source of Title: Title based on content of photograph.